Excavator attachments aren’t cheap. There’s nothing more disappointing than purchasing a brand new tilt hitch and then realising that it’s heavy, chunky with a cheap actuator that weighs the machine down, and looks as if it will most likely break within the first week. That’s why with research and thousands of hours spent in field testing, Calibre says they developed the robust Heli-Tilt Coupler—a proven tilt hitch designed to be compact, robust, and able to withstand the harshest working conditions. The Heli-Tilt took more than 15 years to perfect, with their research and design team having to ensure that the tilt hitch was versatile and had the perfect weight to strength ratio and geometry out on the field. The finished Heli-Tilt provided a unit that isn’t too bulky or too heavy and offered a low profile design to allow operators to gain precise control and improve overall machine performance, the company says. What helps make the Heli-Tilt superior to other competing actuator tilts is its ability to adapt to most applications required by modern-day excavator operators. Calibre says it is one of the first tilts on the market that has minimised the range from the tilting coupler to the dipper arm, which helps increase breakout force and machine performance. Another one of the main attractions of the Heli-Tilt Coupler is its compactness, making it near ideal for conditions where space is confined and rotating flexibility is important. The unit is also said to be particularly suitable for digging narrow trenches and other jobs where precision is paramount. Caibre says that once they knew they had developed the perfect design, things started to get even more creative, which is where the new Sure-Grip Coupler base came in. 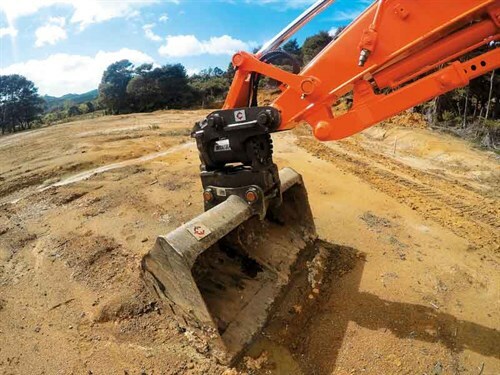 The idea of a tilting-coupler with a smooth one-step connect and disconnect process would save time, costs, and improve safety and efficiency for excavator operators. The Heli-Tilt is manufactured from high-grade steel and also offers a tilt capacity of up to 180 degrees, giving what Calibre says is the highest possible tilt angle available on the market. Calibre is so confident in the Heli-Tilt that they are offering a free two-week trial to put a unit to the test.